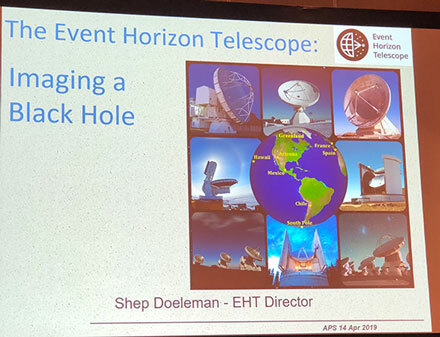 We have seen bits and pieces of the EHT announcement and hope for a more complete YouTube video of the presentation, but for now check out this brief summary of comments made at the April APS Meeting in Denver. Shep Doeleman, EHT Director, started the session off with an overview of the findings. 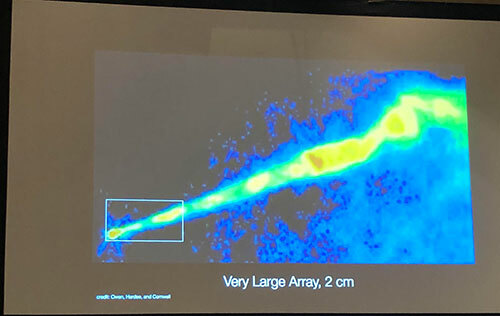 So, everyone keeps waiting for the release of any images at the center of our own Milky Way galaxy, but the analysis of that case is still ongoing. Even though that black hole is closer to us, it is much smaller than the black hole in M87. 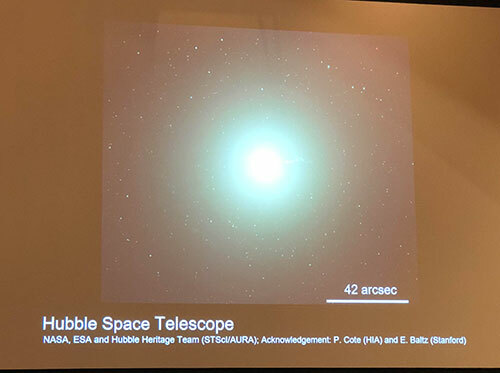 So, Shep started with an Hubble Space Telescope image of M87. M87 will be visible to most of us with just small scopes tonight, but check out this image. So you can't get much better than that unless you move to a different wavelength as possible with the Very Large Array (VLA ) in New Mexico. This image shows the radio image possible at 2 cm wavelength. But, we want to dive down for a closer look like in the box at the lower left hand bottom side. The EHT Collaboration makes an observation of M87 using the combination of eight radio telescopes. The effective resolution of this combination is as if the antenna were the size of the whole Earth. In the following slide, you can see how each individual telescope moves across the sky as the Earth rotates during the observation schedule in one night. Each telescope collects gigabytes of data that can later be synchronized down to the picosecond through use of atomic clocks at each observatory. When the data form all eight telescopes is combined and correlated at two EHT supercomputer centers, each separate radio signal is combined in phase with the other signals. Maintaining phase relationship between radio wavelengths is much easier than trying to do the same thing at optical wavelengths. 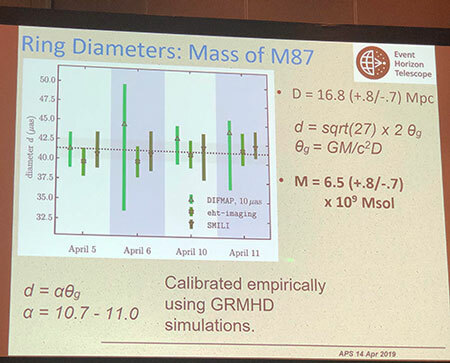 Shep showed the following slide which shows the orientation of the M87 accretion disk and expected image based on that orientation. This prediction from 1979, shows light from the jet facing us is directly visible and apparently light from the jet facing away from us, not normally visible because of relativistic effects, can leak around the black hole and show up in the image that we can see. Data was collected over four separate days in 2017 and the images for each day are shown below. 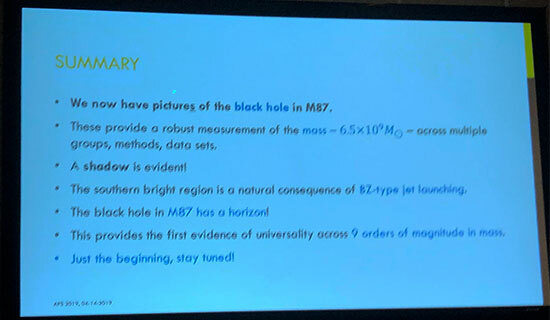 From these days of observations, the mass and diameter of the M87 black hole can be estimated. It is amazing that this technique allows us to see the horizon with a calculated diameter of around 42 micro arc seconds. Pretty amazing! The M87 black hole mass comes in at 6.5 billion times that of our sun and is about 16.8 Mpc away from us. 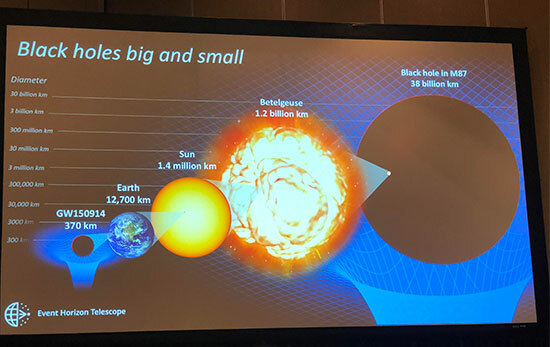 Compare this to the black hole in the center of the Milky Way (Sgr A*), which weighs in at about 4 million times the mass of the sun and is just a little under 8000 pc away. 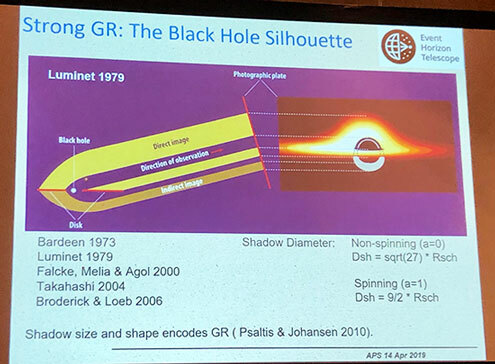 So everyone is waiting for the release of any images and new data for Sgr A*, but we just have to wait for the EHT time to finish their analysis on this closer, but much smaller black hole. 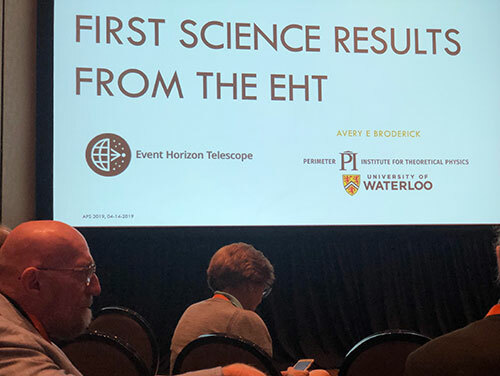 Ok, after Shep finished up his presentation, another member of the EHT Collaboration, Avery Broderick, Perimeter Institute, U. of Waterloo, presented some additional details of the data analysis. 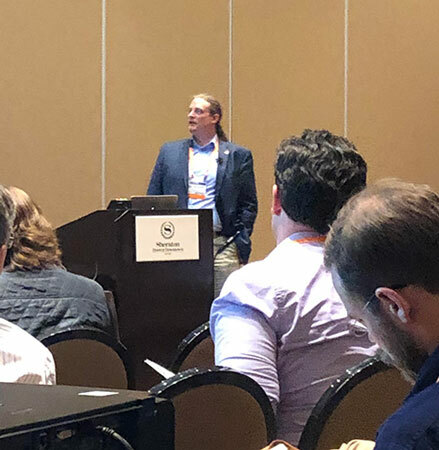 I thought I was well positioned to take some photos of the slides, but just as Avery started his presentation some old geezer came in and sat down in front of me. Oops, wait that is not just any old geezer, that is Kip Thorne, Nobel Prize winner. Ok, ok, sit wherever you want, Kip! I sort of imagined a conversation with the old geezer as if it were at a LIGO presentation and I said, "Excuse me sir, I can't see the findings if you sit there." He responds calmly, "Ok, but without me you wouldn't be able to see any findings, either." Ok, ok, it was just a daydream and nothing happened and the EHT presentation continued. Avery talked about the thousands of different templates used to compare to the measured results. 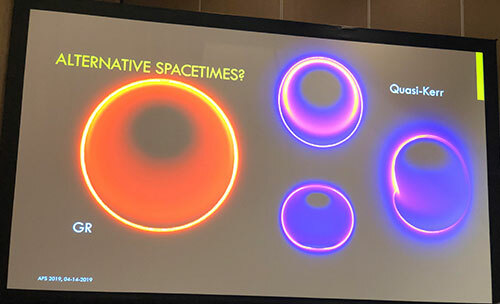 These templates included different sizes of black holes and some with high and low rates of spin. As best as I could tell, the spin of the black hole was not as high as it could have been. Compare the images below with calculated views based on low and high spin. Avery talked about the different lines of analysis used to calculate the mass of the black hole. The slide below shows the four estimates from four different methods. 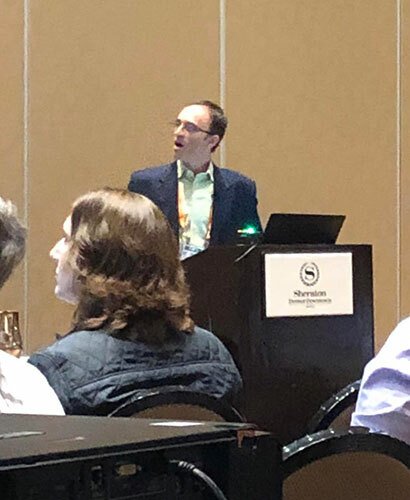 Also, I forgot to mention that during Shep's presentation, he said that after the initial data collection back in 2017 was completed, the EHT Collaboration divided itself up into four separate teams, where each team was separate and blinded as to the analyses being used by the other members, until they all have reached some preliminary results. I didn't manage to get a photo of those four estimates, but my eyeballs said they were pretty much in agreement. Observations of black holes, including those discovered with LIGO, cover mass sizes over nine orders of magnitude. 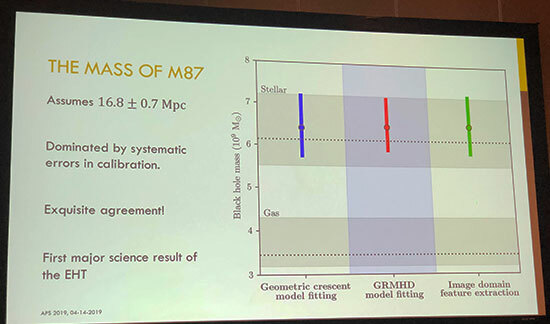 Finally, after saying that Einstein General Relativity predictions had been confirmed by this set of observations, Avery finished up with this summary slide. 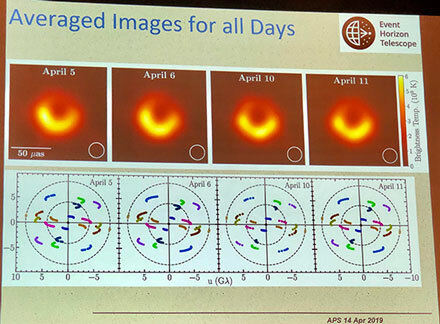 There will probably me more published papers covering these and other aspects of the M87 Black Hole coming out in the near future. 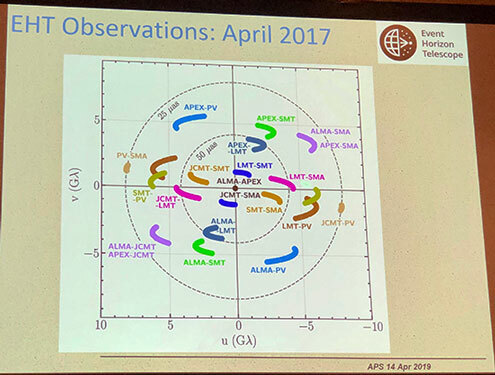 In the meantime, you can always go back and refer to the already released papers on the Center for Astrophysics website identified in the previous blog post of April 13, 2019.